Both the Persian Empire as well as the Roman Empire is counted to date as some of the major Empires to have ever existed. 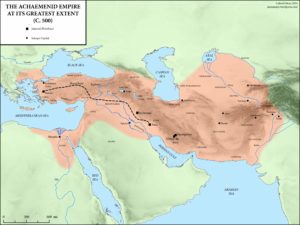 There were many Persian empires with the greatest 3 Persian empires being Achaemenid Empire 550BC, Parthian Empire 247 – 224 AD and Sassanid Empire 224 – AD respectively. The Achaemenid Empire ruled more regions or empires as compared to the Roman empire, by landmass also the Achaemenid’s reached 8 Million Km2 while the Romans reached 6.5 Million Km2. The Roman infantry would be stronger than the Achaemenid Infantry, but not the cavalry. On the other hand, if the Roman Empire was to be compared to the Sassanids, then the Sassanids were mostly like the Achaemenids in-laws. But the Sassanids had worked upon their cavalry and had improved it. In that age, the Sassanids had the worlds finest or the most skilled cavalry. They were unmatched against any other cavalry, the cavalry was named Cataphract and was the world’s first Heavy cavalry, the Achaemenids used Immortals as Infantry, but now the Sassanid Empire used Immortals as Cavalry, The Cavalry Immortals were called ”Clibanarii”. The Sassanids and Romans actually had wars with each other ”Roman–Persian Wars” 92 BC – 627 AD. The Persians didn’t indulge in slavery. In fact, they paid their workers. The Persians official religion was Zoroastrianism. The Persians had freedom for religion. If the people of Rome had a different religion than Paganism, they had to pay Taxes or Get Killed or get themselves converted. The Persians used trousers. As a matter of fact, Trousers were invented by the Persians.